If you’re travelling the globe chances are you’re going to have to get to grips with a squat toilet at some point – and so you should – it’s why we do what we do; those experiences of trying out different things, seeing how the other half (of the world) live. But, giving it a go and getting it right are 2 different things altogether, and are the difference between a messy and slightly traumatic experience you’d rather forget and a dribble free, authentic taste of culture you think about with a smile on your face for years to come. I’ve travelled far and wide through Nepal, India, China and Southeast Asia; prime ‘squat pot’ territory. After a few mishaps, including wet feet and damp leggings, I think I’ve just about got the technique nailed and I’m ready to (over) share. Weird? Yes. Slightly inappropriate? Definitely. But this post might just help save you the embarrassment of walking around with that wet patch otherwise known as a toilet badge, and as a bit of extra back up I’ve called on our loyal twitter community to add their 2 pence worth. Hike up (or remove) as much of the lower half of your clothing as possible – wrap your skirt around your head if you have to girls. If you’re female chances are your stream isn’t going to go where you want or expect it to go so this is the best way of avoiding a soaking on your clothes – a pack of wet wipes is always handy here. Make sure all rings, bracelets, sunglasses are secure, fishing your sunnies out of a toilet bowl after a sneaky peak at what’s going on down under isn’t fun – trust me on that one! @statravel_uk yes squat toilets all through Cambodia … Carry your own toilet roll and role your trousers up!!! Position yourself over the bowl, check for accuracy and stand with your feet on the panels. If there aren’t any then stand with your feet flat on the ground and placed slightly wider than your hips. Squat with your heels flat on the ground, coopie right down until you’re almost sat down, but don’t actually sit down! Standing higher as if you are sitting on an invisible chair will give you an added work out and tone your legs at the same time although this will make aiming a lot harder! @statravel_uk try not to stare when u are in awe of a girl in China who can squat without having to cling onto walls AND text at same time! …If you can help it. Keep your hands and arms on your legs for balance; chances are you’re going to be stood in puddle of misaimed debris from the people before you so a bottle of hand sanitiser is an absolute must. @statravel_uk Singapore Craft Centre in Chinatown. Lets just say my aim was off, it was NOT a no.1 and it was not good. Oops! 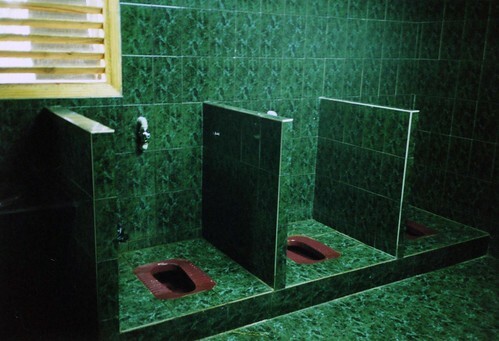 In some places, largely China and India, you will find squat toilets in cubicles without any doors, if you come across this I suggest you go with it – if you can – although there’s a very good chance stage fright will creep in and you’ll be there for a while. It may seem strange to us but these sort of communal toilets are pretty common in some parts of Asia so take a deep breath and embrace the exact kind of cultural differences you’ve travelled all this way to experience. Toilet paper and soap are a very rare treat in most squats toilets and long drops – except for the posher ones obvs. Always try and keep a spare roll or packet of tissues in your bag (this will come in handy for a quick clean up/wipe down after too). *Top tip – Don’t shake hands using your left hand in India just incase. The ‘right hand for eating, left hand for wiping’ whisper is not a myth. This tip is especially important for all you left handers out there. A squat toilet generally take less water than a regular toilet and in some places in Africa and Asia you will simply have a long drop squatter (i.e no flushing required) but most places in will have at least a bucket and plastic tub next to the squat – one bucket full of water down the hole and voila, you’re done! 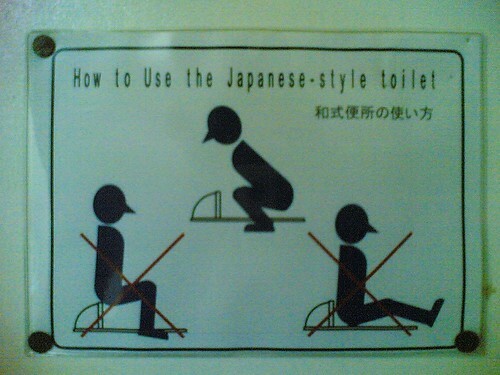 *Top tip #2 – don’t flush until you are standing again though or you will probably get wet! @statravel_uk Make sure you step off before you flush, otherwise you get wet feet!! So there you have it our top tips for a pleasant squatting experience. Anything we’ve left out? Any squat toilet based stories to tell? Let us know about it in the comments box below!